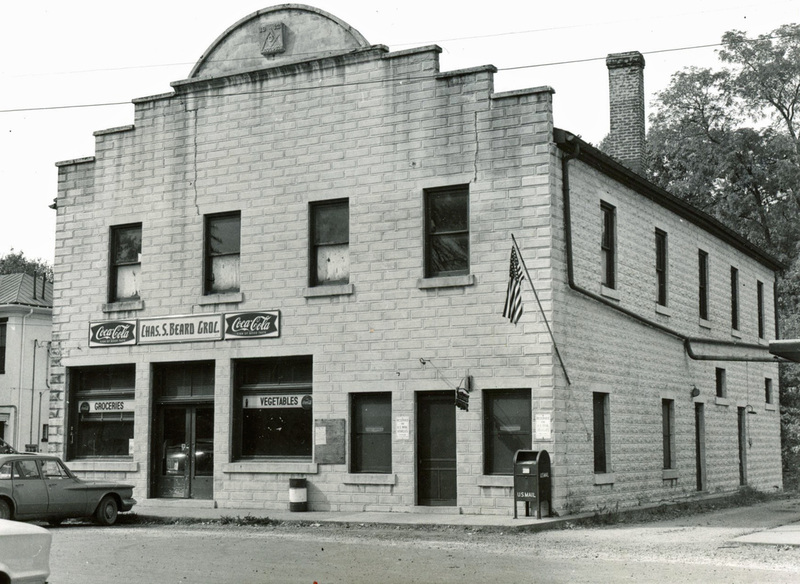 From about 1920 until 1955, Brent Pinnell Million (March 2, 1895-November 12, 1966) operated a grocery store on the first floor of the building that is now the Little Colonel Playhouse. 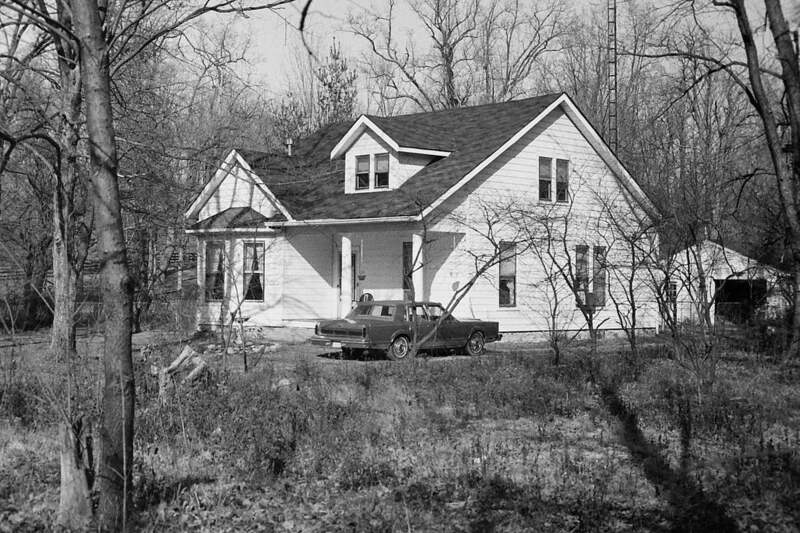 The Oldham County native moved to Pewee Valley in the 1920s with his new wife, Irene Hitt (October 11, 1894-October 21, 1996). 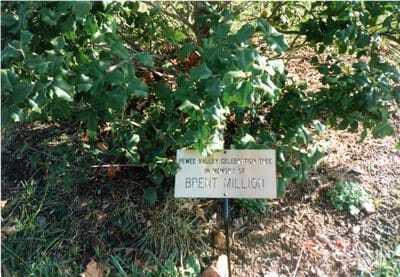 Brent was a WW1 veteran and was in the service from 1917 to May 24, 1919. He served overseas under General John J. Pershing and was among the 1.2 million Americans who fought in the Meuse-Argonne Offensive that eventually ended the war. 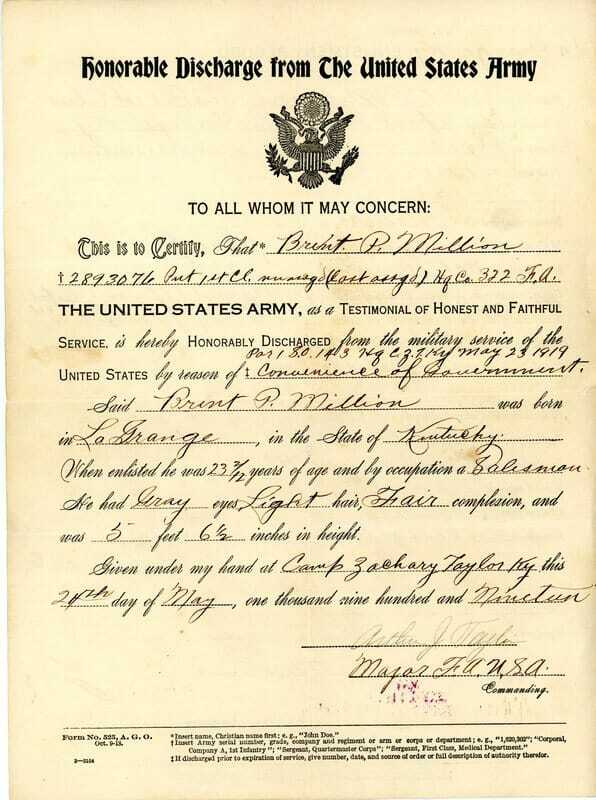 Just two weeks after his discharge from the U.S. Army, he married Irene. 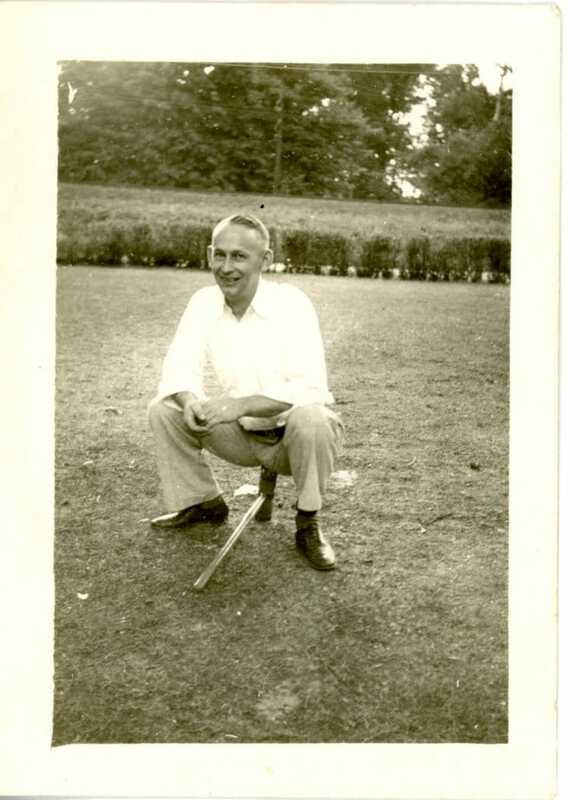 Prior to his war service, he'd worked as a grocer for the Duncan Company Department Store in LaGrange. Duncan rehired him when he returned from the war and sent him to Pewee Valley to open a second location. In 1923, Brent purchased the store from Duncan and it became Millions Grocery. 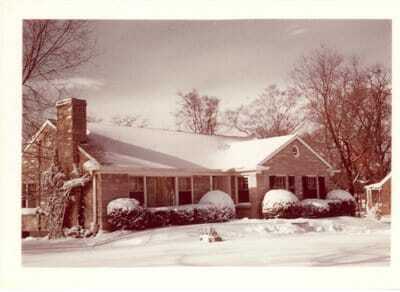 By the 1930 census, he and Irene were living in the old Villa Ridge School building behind Edgewood. 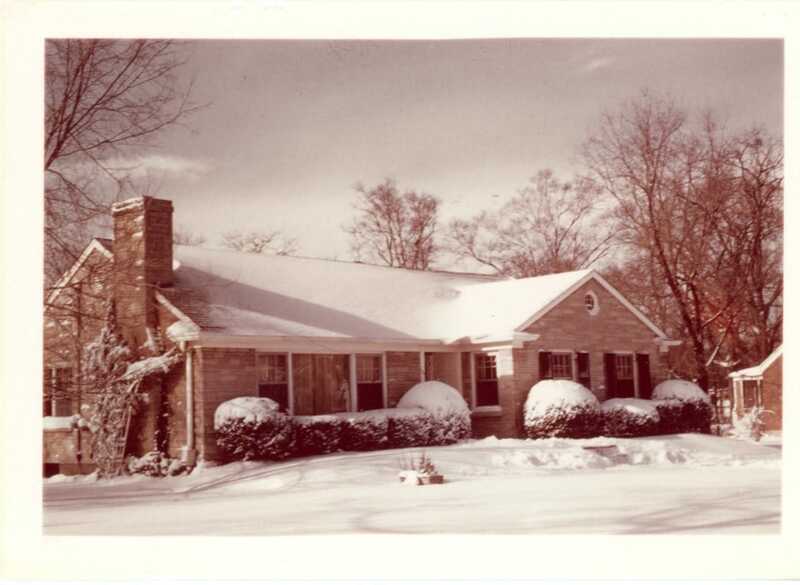 In 1936, the couple purchased a bungalow at 111 Central Avenue, just a few minutes' walk to the store, where they lived until 1950, when they sold it and moved to a new brick ranch on Tulip. a two-car garage located on the premises. Brent Pinell Million, 71, a Pewee Valley civic leader, died at 7:30 a.m. Sunday at his home, 124 Tulip in Pewee Valley. He was a native of LaGrange, Ky., and had operated a grocery store in Pewee Valley for 35 years before he retired in 1955. 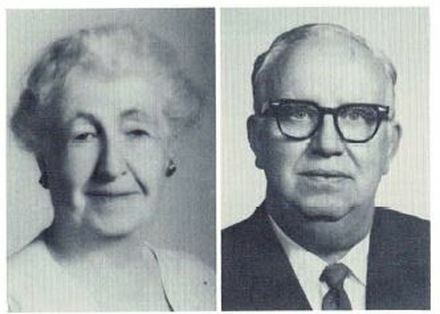 Million was a member of the Pewee Valley City Council from 1958 to 1966 and was a former member of the Planning and Zoning Board there. He was also a member of the American Legion. His wife, Irene, lived another 30 years and died on October 21, 1996 at the age of 102. According to her nephew J.B. Hitt, Irene mowed the lawn of her Tulip Avenue home well into her 80s and played cards the day before she died. The Millions had no children and were very private people. Before her death, Irene burned all but a few legal documents. She left her estate to her six nieces and nephews. Beards Grocery in the 1950s. The Post Office, which had moved from Central Avenue, was on the building's east side next to the supermarket. From "Pewee Valley: Land of the Little Colonel" published by Katie S. Smith in 1974. 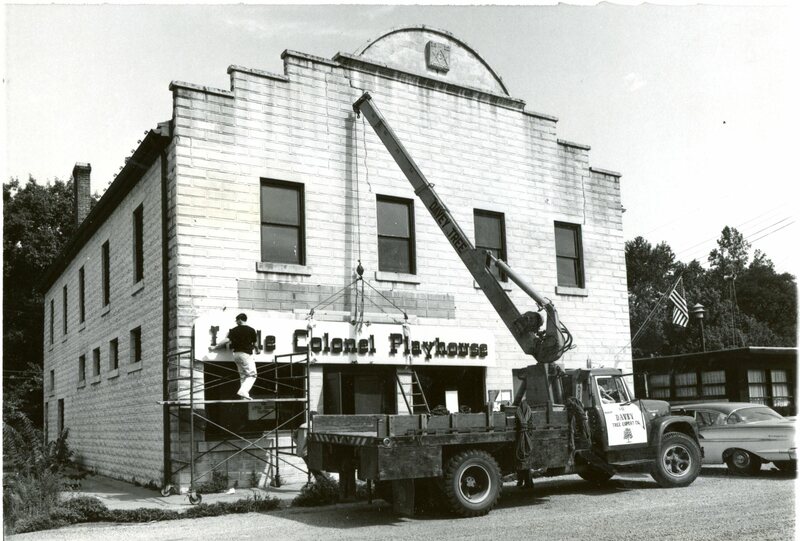 Hoisting the sign on the new Little Colonel Playhouse the weekend of August 15-16, 1964. The one-story building next to the Playhouse was the office of Dr. Burl Mack. He added a second floor in the 1970s, giving the medical office building the appearance it has today. From "Pewee Valley: Land of the Little Colonel" published in 1974 by Katie S. Smith. 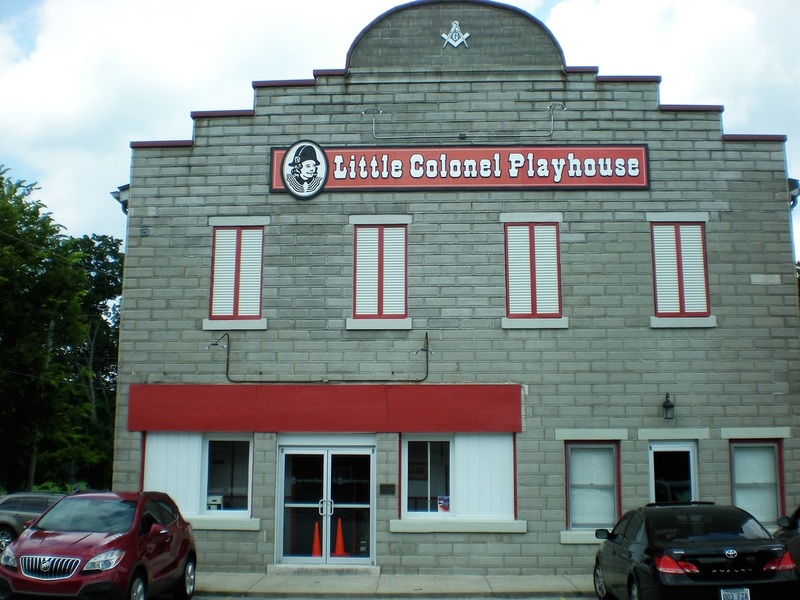 The Little Colonel Players was founded in 1956 “...to foster the art of drama by presenting plays of an educational as well as entertaining value to its members and the public…,” says the mission statement. It was named for author Annie Fellows Johnston's character Lloyd Sherman, who was nicknamed the Little Colonel in the popular children's series. Annie's stepdaughter, Mary Johnston, was made an honorary lifetime member. 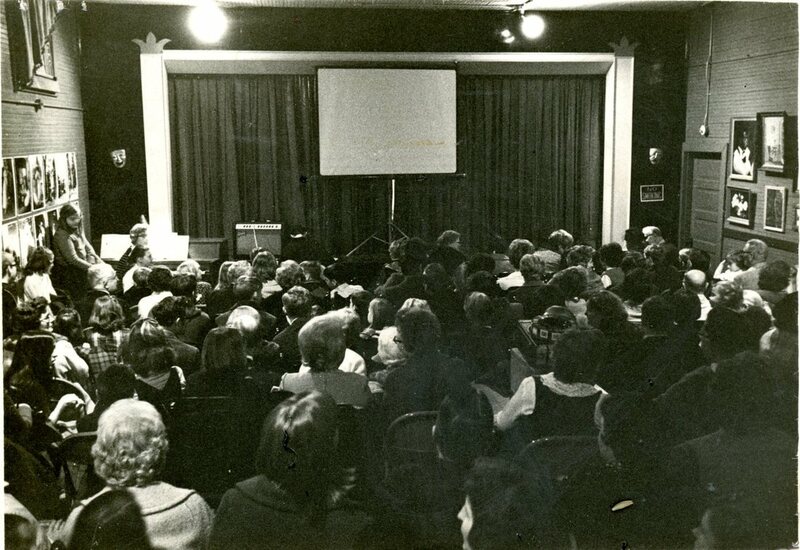 In 1956, the Pewee Valley Woman's Club decided to found a little theatre group that would serve the cultural interests of Pewee Valley and the surrounding area, including Oldham and Jefferson counties. The Little Colonel Players, Inc., were incorporated in that same year. Members met in homes and on the second floor of the present Little Colonel Playhouse, primarily for the purpose of reading plays and discussing drama in general. The participants found the acitivity so enjoyable they decided to include the general public in the fun and to invite interested people to become actively involved, either as thespians, stage crews or audience. The group had presented a one-act play before the Woman's Club, a skit for the South Oldham Lions' Club, and a melodramatic farce at the Farm and Home Week in Lexington. The Strand Theater, opened in 1902 at the Masonic Temple Building in downtown Louisville, was the source for some of the seats at the first Little Colonel Playhouse at Valley Camp. 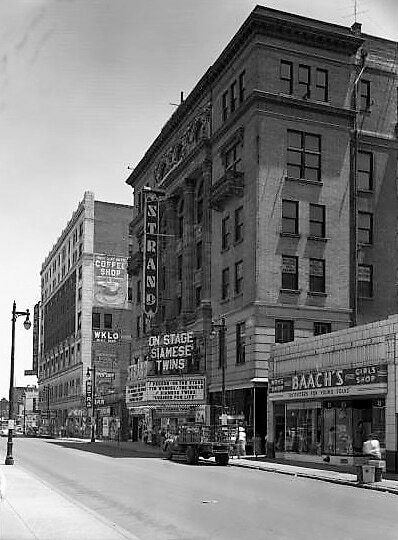 The Strand closed in 1952 and was demolished in 1954. After a two-year search for a place in which to stage productions, the Little Colonel Players, Inc., of Pewee Valley have set up quarters in the main building of Valley Camp, a summer camp in Pewee Valley run by the Community Chest. With a base of operations remodeled mostly by the members themselves, the Players will open a spring season of plays with a program of three, one-act plays Friday and Saturday nights at 8:30. 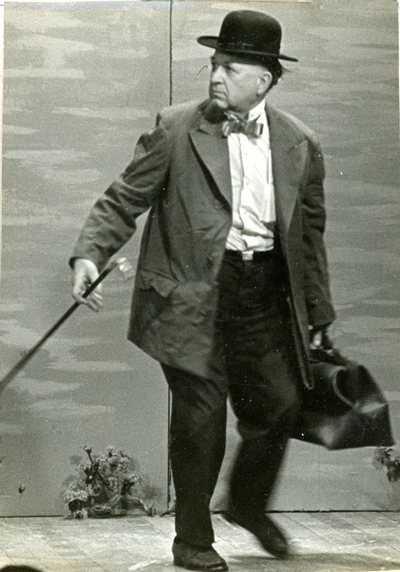 The plays are "The Tenth Word," a comedy by Colin Clements and Florence Ryerson; "Over the Teacups," a serious comedy by Percival Wilde; and "Little Nell, or The Triumph of Virtue," a farce on an old-fashioned melodrama. "The Tenth Word" and "Over the Teacups" are directed by Philip H. Hollenbach, a veteran of many community plays who also is director of plays for the Little Colonel Players. Mrs. Allen E. Clark is directing "Little Nell." 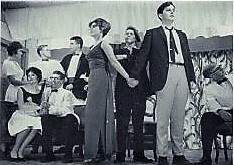 Although the Players group was organized two years ago, its only productions so far have been a one-act play presented before the Pewee Valley Woman's Club, a skit presented before the South Oldham Lions Club, and a melodramatic farce given at the Farm and Home Week in Lexington in January. Player members are from Oldham County and Jefferson County. This year's president is Dr. George Perrine, surgeon in Pewee Valley and Louisville. 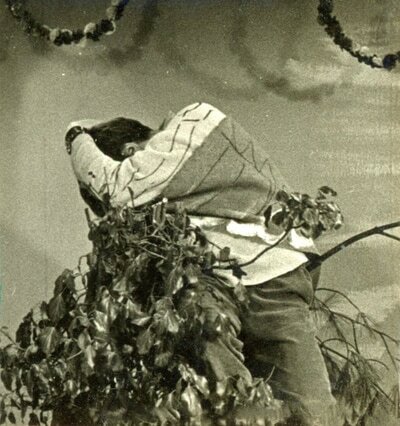 The Players succeeded in renting a building for a theater from the Community Chest for the fall, winter and spring and got permission to convert one wing into a theater. Doing most of the work themselves, the Players members have built a stage, installed a furnace, covered walls and ceilings with insulation board -- all at a cost of about $1,000. Dressing rooms are still needed, but the Players may use a tent or trailer for the first productions. ...Besides the weekend program of one-act plays, the Players will offer two additional productions this spring. On Saturday, May 17, the Players will present the University of Louisville Players in "The Lark." On May 30 and May 31, the Little Colonel Players themselves will present "George Washington Slept Here." Time out between plays has lasted a lot longer for the Little Colonel Players than for most actors. For the past year instead of building roles, they've been constructing a theater in a former grocery store in the heart of Pewee Valley. Friday and Saturday, their enlarged stage curtain will go up for the first time in a new setting, and the show is Philip Barry's "Spring Dance," presented by the playhouse's college-age members. Last year the first summer production of the college crowd rang down the curtain in the Little Colonel Players' former theater (now torn down) at Valley Camp. Casting about for a new site, the group decided on a vacated grocery store at the corner of Central Avenue and Mt. Mercy Drive, which actually was its starting point six years ago. Upstairs over the grocery Pewee Valley Woman's Club members met for a year in 1956 working out organization of a community theater, which grew into the Little Colonel Players. ... A Victorian atmosphere is what they're aiming at, says Mrs. Milton Glock, mother of one of the hard-working families involved. On one inside wall, already painted red and brown, there'll be panels of red velvet and gilt with wall lamps eventually. And the big front windows will be remade into shadow boxes for posters and pictures. By no means will all the vast redecorating schemes be finished by opening night, but the actors do face two intruders who must be coped with. ... A cage may be his box seat for the play. The other intruder is less tractable -- the L & N "which might as well go through the theater" when it passes by outside at approximately 8:30, 9, 9:07 and 9:30 p.m. 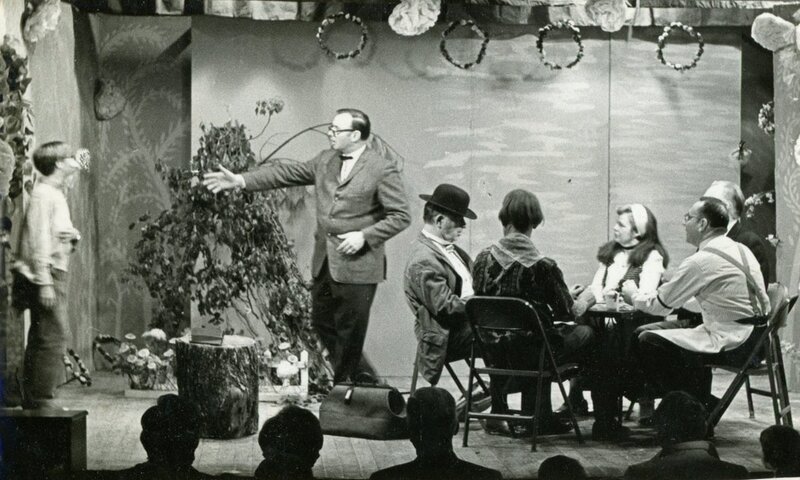 The interior of the Little Colonel Playhouse at the opening of "This Is the Way It Was," a dramatic farce based on Noble Butler's "Antiquitates Peweeji," telling the story of how Pewee Valley got its name. From "Pewee Valley: Land of the Little Colonel" published in 1974 by Katie S. Smith. 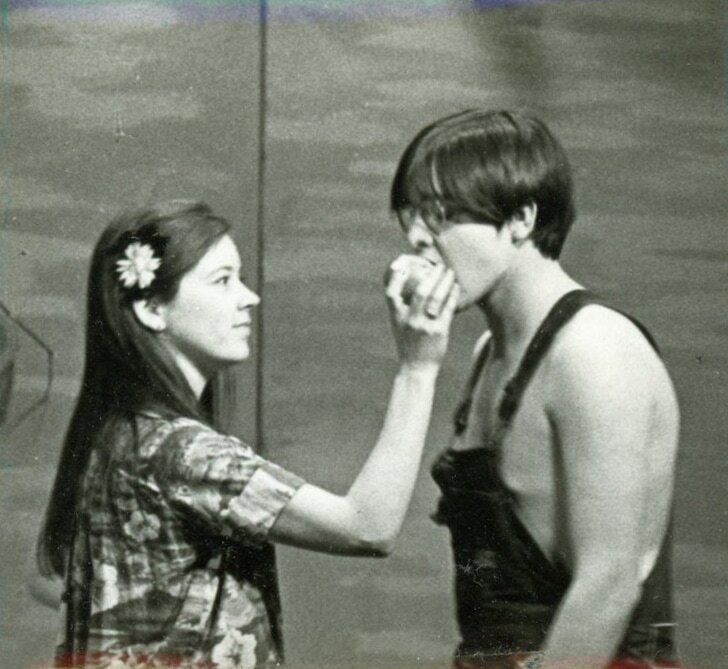 March 15, 1970: The Little Colonel Playhouse Celebrates Pewee Valley's Centennial with "This Is the Way It Was"
Cast and Scenes from "This Is the Way It Was"
​ from Katie S. Smith's 1974 History, "Pewee Valley: Land of the Little Colonel"
October 26-29, 1974: Little Colonel Playhouse Salutes Kentucky Bicentennial with World Premiere of "The Little Colonel in Lloydsborough"
...Hammer, drama chairman for the Arts Club this year, did the words for an original music production for the club several years ago. He has directed senior plays at Presentation Academy for the past two years. Hammer is credit manager at Kentucky Machinery, Inc.
Meyer, Editor of the GE News at General Electric, said most of his experience in theater has been as an actor. He was in "The Mouse That Roared" at the Little Colonel Playhouse last season, and he recently played a leading role in "Two by Two" at Heritage Theatre. In the play the Little Colonel and her parents have moved to Lloydsborough, and she meets her grandfather (her mother's father) for the first time, not knowing they are related. ... Even if winsome Elane Peters... never advances her stage career..., she can someday tell her children and grandchildren that once upon a time, she starred in a stage role of no small historical consequence. As the star of the world premiere of "The Little Colonel in Lloydsborough,," ... she not only brought the famous storybook character to the stage for the first time, she brought her back home, back to where the Little Colonel books originated. Moreover she became the second actress ever to play the Little Colonel. The first starred in the movie in the 1930s. She was a gorgeous child, one who used the Little Colonel role to capture the heart of America. Her name was Shirley Temple. How did Elaine Peters feel, stepping into Temple's patent leathers, so to speak? Did she hope to become America's next little darling? ... 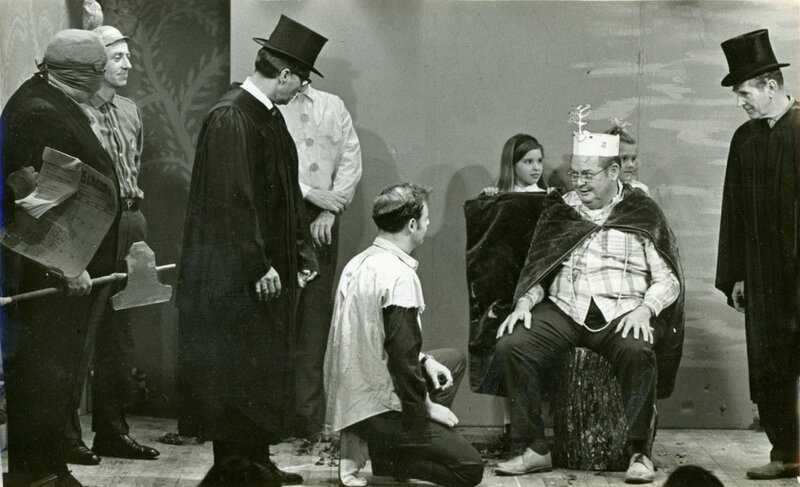 Ever since the Little Colonel Playhouse was founded in 1955, the theatre's directors have been wanting to do a play on the Little Colonel books. ​In 2006, the playhouse celebrated its 50th anniversary. Helen E. McKinney, contributing writer for Roundabout, covered the festivities in her September 2006 story, "Little Colonel Playhouse takes center stage:"
PEWEE VALLEY, Ky. (September 2006) – John and Velma Vaughan met 34 years ago at the Little Colonel Playhouse in Pewee Valley. John, 49, had a part in “Vacancy in Paradise,” and Velma was on the set crew. Romance blossomed and after 28 years of marriage, the Vaughans are still attached to the place where they first met. Although not as active as they used to be, Vaughan said it’s always been fun for the whole family. Their children became involved and participated in summer productions. As with most Little Colonel Playhouse members, the Vaughans have served in a variety of ways, including acting, set design and cooking for the opening season dinner theatre nights. She first attended the playhouse with her family at age 13. Her parents were friends with Phil Hollenback, a veteran actor from Louisville who was the playhouse’s first director. Hollenback convinced Vaughan’s mother to bring the family to a performance. Her father became an actor and, naturally, the family always tagged along. The Vaughans will take part in activities surrounding the 50th anniversary of the Little Colonel Playhouse. On Sept. 15, an Open House is scheduled from 7 p.m. to 9 p.m. Tours will be given of the theater by board members who will share the building’s historical background. Visitors can see what improvements have been made over the years, ask questions and enjoy refreshments. On Sept. 16 from 6:30 p.m. to 9:30 p.m. a 50th Anniversary Gala will be held next door at St. Aloysius Church, 212 Mount Mercy Dr. This location was chosen because it can hold more people than the theater, said board member Bethany Morse. “We will have people flying in from all over,” she said. This semi-formal gala will include a buffet. This evening of reminiscing will include different presentations that will recognize members for various accomplishments. A presentation of the upcoming season will be presented. The 50th anniversary season includes one show from each decade of the playhouse’s history. “It will be a great evening to get in touch with members you haven’t seen in a long time,” said Morse. She has been on the board of directors for a season and a half. A special DVD highlighting the history of the LCP has been produced by long-time playhouse member Bill Baker. It will be shown during the evening. 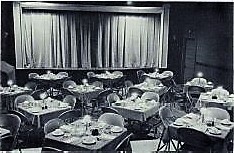 Baker and his wife, Lynn, became involved with the playhouse in 1975. Mayor Bob Rogers and Chief Mike Losik had wrapped up an interview with WHAS 11 earlier in the evening regarding an ongoing problem with CSX trains parking on the tracks and blocking multiple crossings in Pewee Valley for hours at a time. Little did they know, the paparazzi would be back in town the next morning to report on high winds (and possibly a tornado) that blew through the City damaging our beloved Little Colonel Playhouse. The winds felled trees and power lines, damaged numerous homes in our City and several cars were destroyed in the parking lot at St. James Episcopal Church. According to Mayor Rogers, a little before 8:00 pm on Tuesday, January 29, he stopped by City Hall because another CSX train had stopped on the tracks. He called the WHAS news desk and they wanted to talk again but said they would have to call back – there was a lot of news coming in at the time because of severe weather in the area. As he waited, the Mayor fixed a pot of coffee and Greg Rose and Glen Rowland stopped in. A short time later, they heard a roar and the lights went out in City Hall. What they thought was a train was actually a transformer that blew. The men stepped outside and that was when they discovered the damage to The Little Colonel Playhouse. They had to manually override the doors to the old firehouse bays so they could get the town’s Blazer out. The Pewee Valley Fire Department arrived within minutes. At that time, the only crossing open was at Muir Lane – the other two Mt. Mercy crossings were still blocked by the train. Central Avenue was blocked with trees and downed high tension wires. Mt. Mercy in front of St. Aloysius and Muir Lane also had downed trees and power lines. It’s estimated that over one-third of the City lost electricity that evening. Using the Blazer, the gentlemen pushed the concrete rubble around the Playhouse up near the building to open up the road. The Fire Department secured the scene with caution tape and the Mayor waited for the Oldham County Building Inspector to arrive. He was soon joined by Councilman Stan Fitch and Police Chief Mike Losik, who was off duty at the time. The Chief went to work to ensure the safety of several residents known to be on oxygen. Kevin Nuss, the Oldham County Emergency Management Director dispatched the Oldham County Road Department. They assisted Pewee’s volunteer fire department in checking all City roads for downed trees and power lines. LG&E was called to come in and kill the lines before the trees could be cut up and removed. Because it is a state road, once the lines were cleared, the State Highway Department was waiting to clear trees from Central Avenue. Jim Brewer, head of Pewee Valley’s Tree Board, immediately went to work and located a contractor that could come in to cut up and remove trees from other City roads. That evening, Shively, St.Matthews and Anchorage fared no better than Pewee Valley. In fact, it was confirmed that tornadoes touched down in those communities. Louisville had as many as 29,000 households without power, so needless to say, LG&E was working through the night to bring service back to all its customers. After the trees and debris were cleared, LG&E was back to start repairing the downed lines in Pewee. Several crews were brought in and the subcontractor for LG&E repairing the lines on Central Avenue actually lived 30 minutes outside Bristol, Tennessee. Despite the widespread damage, electricity was restored to all residents within 48 hours. were no final numbers in on the cost of clean-up. Was this a tornado? Kevin Nuss has contacted the National Weather Service and is waiting to hear back from them. According to Mayor Rogers, the civil defense siren did not go off that evening. Central Dispatch in LaGrange is responsible for sounding the alarm, but they may not have received notice from the National Weather Service. Mayor Rogers, Police Chief Losik, Fire Chief Hamilton and Councilman Stan Fitch will be meeting with Oldham County Emergency Management to analyze the City’s and County’s response and offer up suggestions for improvement. It goes without saying that these individuals, and everyone mentioned in this article, should be applauded for their timely and efficient handling of this emergency. Their quick response and follow-through is deeply appreciated by the citizens of Pewee Valley. As for CSX, it was still several hours before the train was moved from our crossings. ... Pewee Valley Mayor Bob Rogers said he was sitting in Town Hall Tuesday night when a transformer blew behind the building. Then he heard a portion of the Little Colonel Playhouse topple onto Mount Mercy Drive. He said he thought the sound was a tornado. The front wall of the playhouse buckled as high-speed winds swept through Pewee Valley. 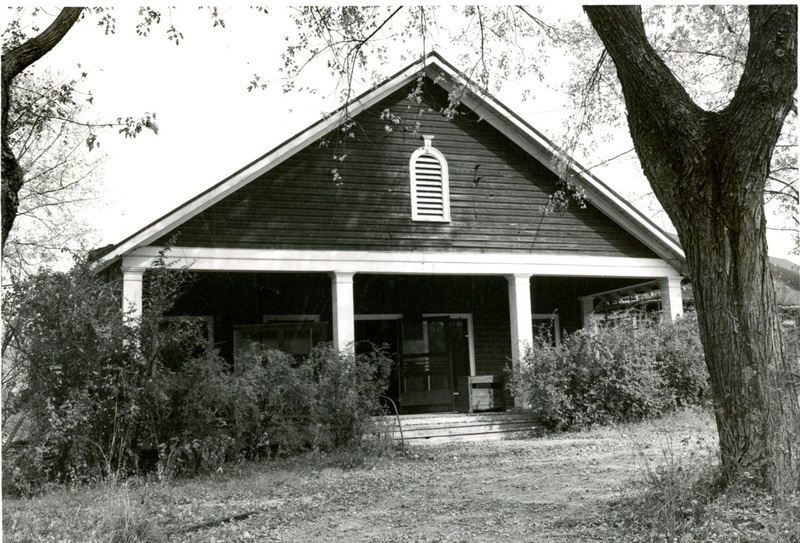 A celebration to spotlight Pewee Valley's "Little Colonel" legacy was planned Feb 9 and 10, featuring a play at the Little Colonel Playhouse, tours of historic homes, an exhibit and a luncheon. "It's a sad time in the city for this to happen to the Little Colonel," he said. At St. James Episcopal Church, participants in an Alcoholics Anonymous meeting Tuesday night rushed to the parking lot after they heard a loud "pop" outside. Terry Dunn said when he looked outside, he saw several vehicles beneath a large tree uprooted from the church lawn. Dunn said his sister borrowed his care to make a run to Wal-Mart while he attended the AA meeting. AA participant Calvin Greer wasn't so lucky. He paced the sidewalk outside St. James, sneaking glances at his crushed 1990 Ford Mustang. 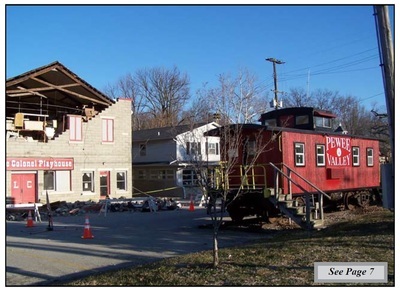 ...Rogers said he's trying to bring to light the issue that railroad companies face only a $25 fine for blocking a crossing for five minutes or more, while the hazard of blocked crossings could delay or prevent emergency crews from helping Pewee Valley residents. "What's a $25 ticket to CSX?" he said. 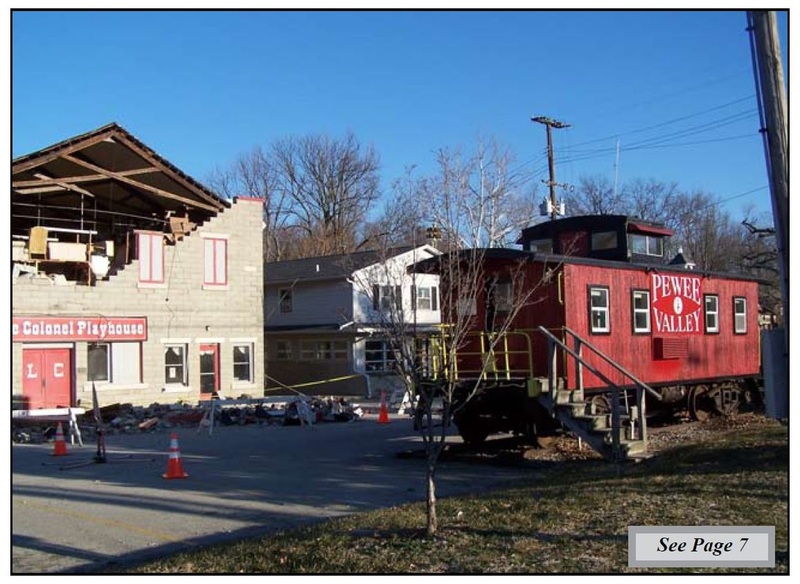 Less than three hours later ... Rogers watched in disbelief as firefighters from the Pewee Valley Fire Department were forced to drive down Ky. 146 and access an open railroad crossing at Mount Mercy Drive rather than crossing at Central Avenue to respond to trees down outside St. Aloysius Church and the collapse at Little Colonel. A CSX train stopped on the tracks in Pewee Valley for nearly 90 minutes...."
... While firefighters secured the perimeter of Little Colonel Playhouse and responded to reports of downed utility lines, members of Pewee Valley's road crew traveled through the city to clear roadways blocked by tree limbs. ...Wednesday morning portions of Pewee Valley roads remained closed. 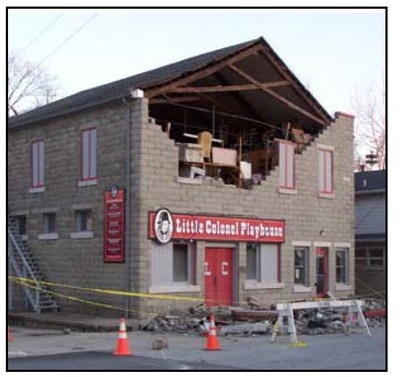 Damage to the playhouse was estimated at $82,500 and the repairs took several months to complete, because special concrete blocks had to be made to match the rest of the building. Undaunted, the Little Colonel Players made sure the show went on. Their April production of Neil Simon's "The Odd Couple" was presented at the Anchorage Elementary School Auditorium. 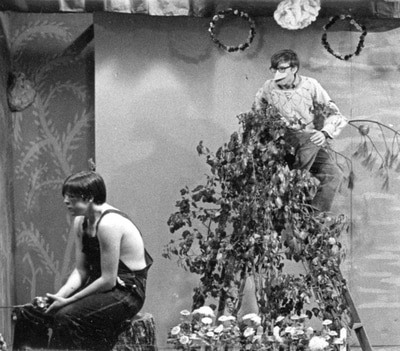 By May, the theater group was back inside the playhouse, while work continued on the exterior.